4 Skin Tightening Treatments - Get Rid of Loose Skin Today! For patients who prefer not to undergo a partial or full facelift, choosing one of the latest skin tightening treatments provides an excellent alternative to the invasiveness of surgery. Downtime with this procedure is typically shorter, and the cost is considerably lower. As an added perk, the positive results offered by today’s skin tightening treatments are undeniably beautiful and last well up to a year or two. If you are tired of wishing for younger-looking skin, it’s time to step out of your comfort zone and realize just how youthful your face and body can appear after a skin tightening treatment. Many options for skin tightening exist, and the most popular treatments today include Thermage, Active FX, and Coolsculpting. Their success comes partly from their ability to stimulate new elastin and collagen growth, enhancing the skin’s elasticity and supple nature. Each of these skin tightening procedures also smooths the appearance of an individual’s skin by improving its texture and tone. If you are ready to put away your skin-firming lotions and creams in lieu of a non-surgical skin tightening treatment that delivers long-lasting results, keep reading to learn more about your options. 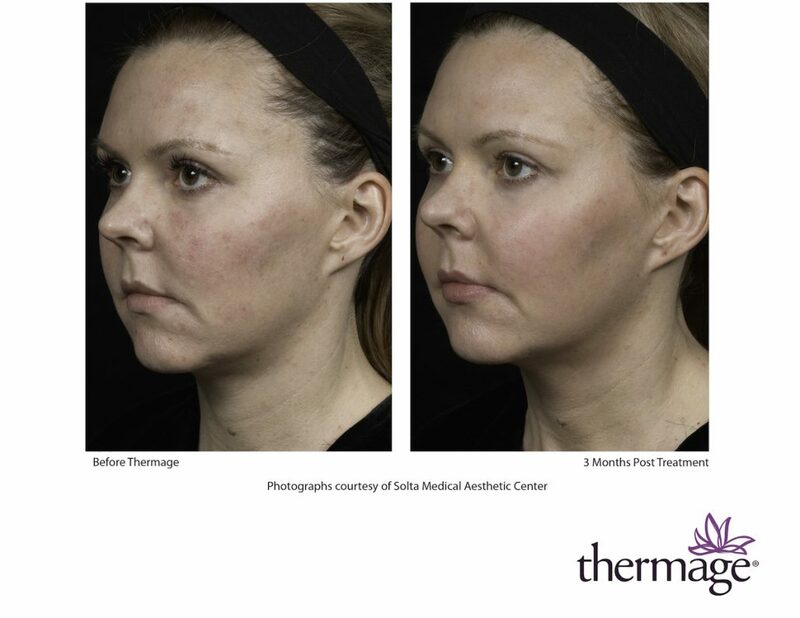 Thermage is a non-invasive procedure designed to assist in contouring and tightening the skin. It embraces the power of Capacitive Radio Frequency technology, which is more commonly referred to as CRF technology, to create younger looking skin by improving its color and tone as well as its firmness. While it may not make sense at first to consider using radio frequencies to smooth and beautify your skin, this noninvasive treatment tightens, firms, and smooths your skin painlessly and easily. 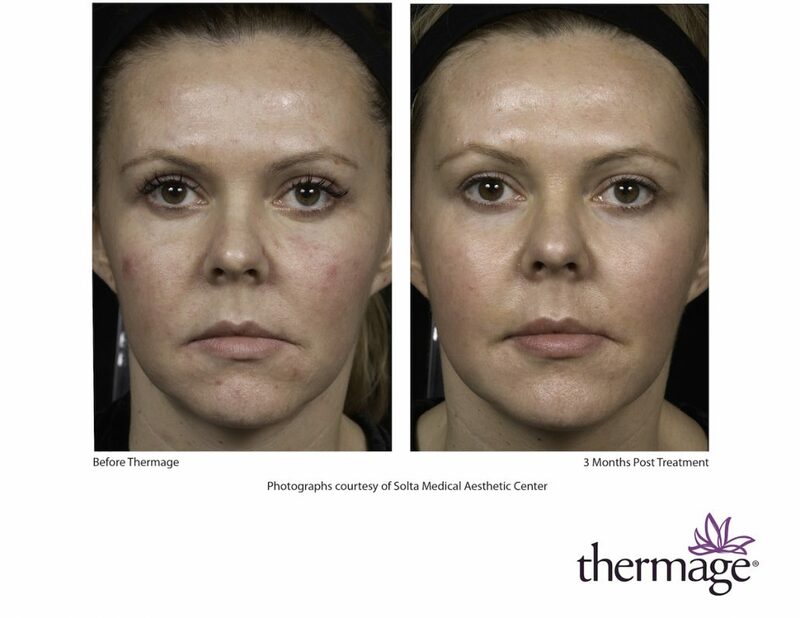 Thermage is commonly used to beautify the skin around the brows, eyelids, neck, and lower portion of the face. It does so by targeting these areas using radio frequencies chosen for their ability to tighten and shrink the skin. 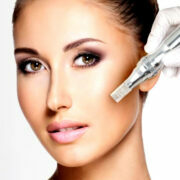 CRF Technology allows your cosmetic specialist to penetrate all of your skin layers in a single setting. The treatment gently heats the skin to stimulate collagen production, a necessary component of supple skin. More specifically, the radio frequencies interact with existing collagen fibers, causing them to begin producing higher levels of this amino-acid based protein. Collagen supports the skin’s elasticity and strength, helping it to resist the signs of aging. 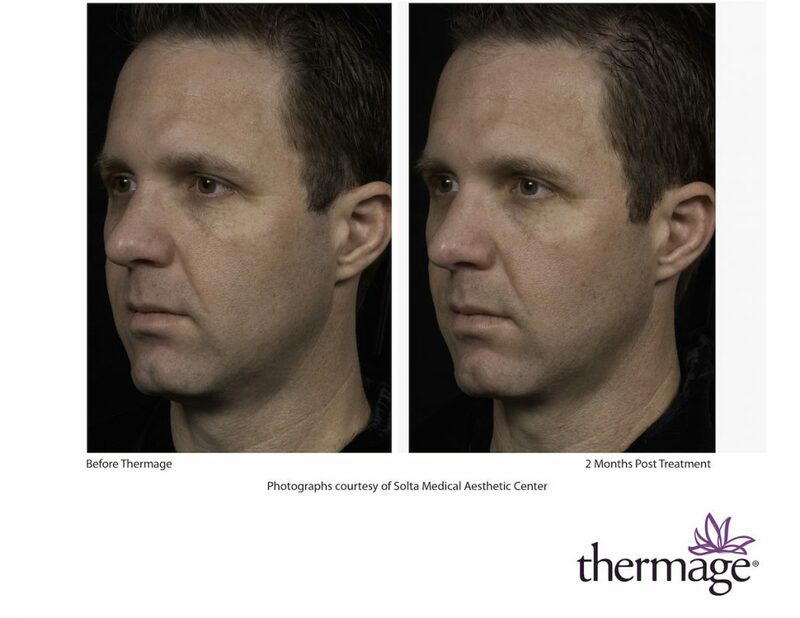 Although Thermage doesn’t actually melt fat away, it does deliver the illusion that fat has simply disappeared from the face or body. 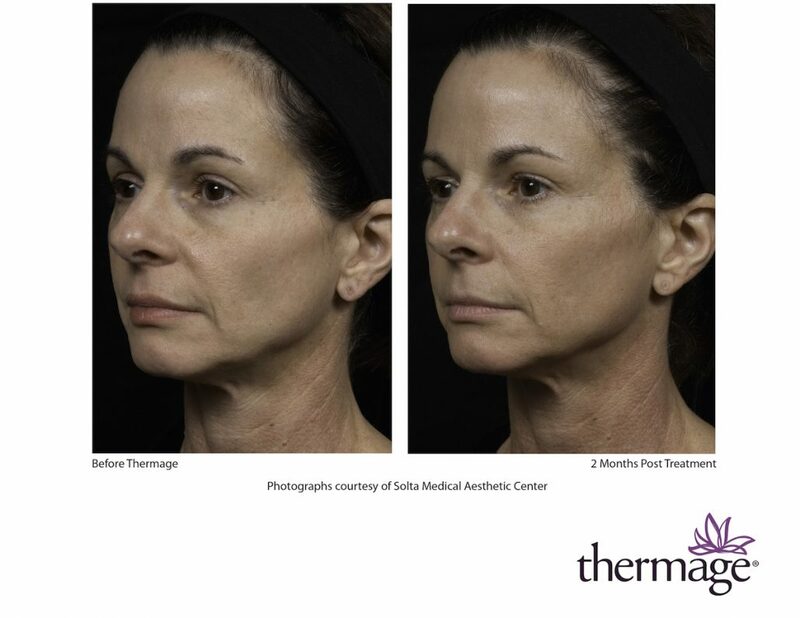 This illusion stems from the successful skin tightening results delivered by the Thermage procedure. The increased production of collagen helps maintain healthier, stronger skin and promotes lasting results that remain for up to six months. In fact, while you will notice an immediate refinement in your skin’s appearance after your Thermage treatment, this improvement will continue to grow over the next few days and weeks. Most patients require only a single treatment per area with no apparent downtime. On occasion, a second treatment may be required for particularly stubborn areas of skin. Although results vary among patients, most individuals can expect to see these enhancements last for half a year. Eventually, the skin begins to lose some of its renewed firmness and enhanced texture, leading to the need to make a new appointment. 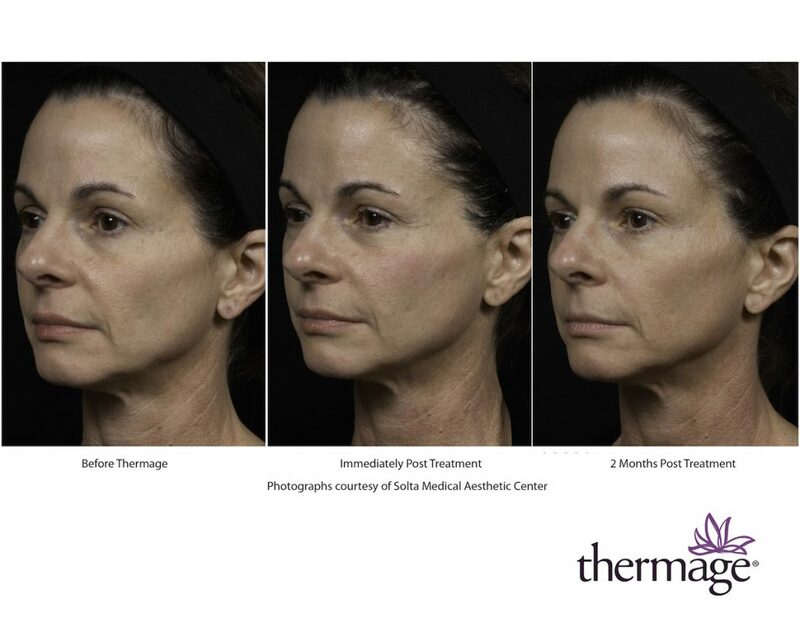 The best time to schedule another Thermage procedure is once you notice the results of your first treatment are beginning to fade. 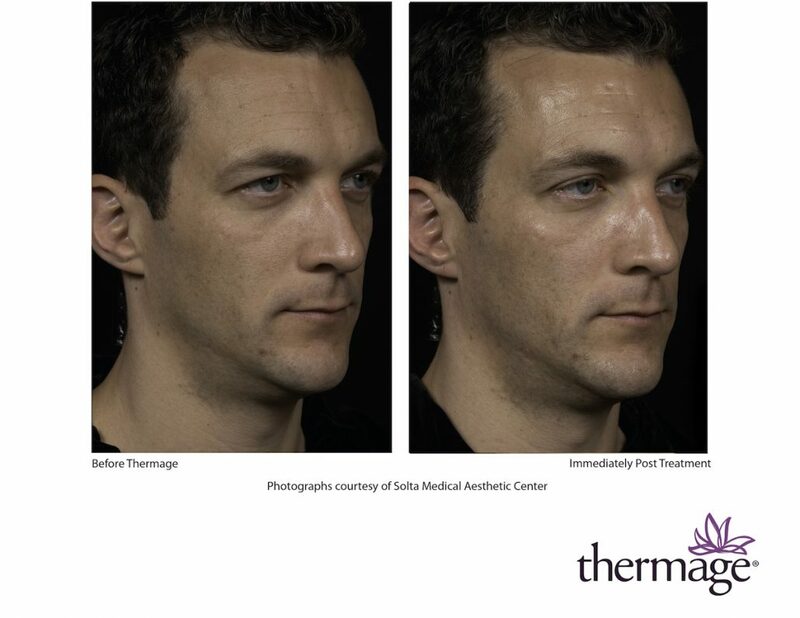 Thermage is safe to use on all skin types. 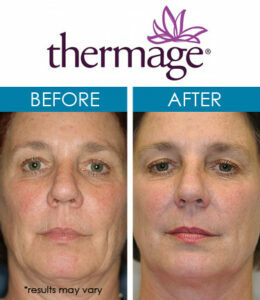 The Thermage procedure is painless before and after the treatment. During the procedure, you will feel the sensation of heat on treated areas as the radio frequencies target specific areas of the skin. Although you will experience warmth, the tip of the device remains cool at all times. The device is designed to apply a cooling spray to your skin when its surface temperature reaches a certain point. Depending on the size of the area being treated, your procedure can last between one and two hours. Most patients experience no discomfort. Individuals with a sensitivity to this type of cosmetic procedure can receive a topical anesthetic or over-the-counter pain medication to alleviate any discomfort they experience without influencing the results of the procedure. Laser Skin Resurfacing with Active FX embraces the technology behind fractional laser technology to remedy skin damage caused by the natural aging process, environmental factors, and poor skin care. It is designed to make the skin look plumper and younger as well as to encourage a softer yet more elastic texture. It can be used to treat acne scarring, fine lines, deep wrinkles, and uneven skin coloring. This cosmetic procedure is popular due to its ability to minimize the signs of aging that take away from the natural beauty of the skin. It minimizes the appearance of imperfections gently and safely as it softens fine lines and wrinkles, reduces discoloration, minimizes sagginess, and help restore some of the skin’s natural ability to resist damage. 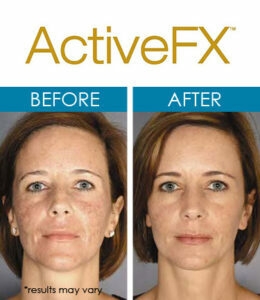 Active FX promotes the new growth of skin cells to deliver younger-looking skin. In particular, this skin tightening treatment improves both the firmness of the skin as well as its elasticity. It is primarily used to minimize noticeable signs of imperfection on the face. Active FX also promotes renewed collagen production, producing long-lasting results. While you may be able to notice results immediately, the full benefit of this procedure takes time. The boost in collagen production continues to improve your skin’s appearance, enhancing the overall results achieved with this innovative skin tightening procedure. Prior to your Active FX treatment, your skin is numbed to minimize any discomfort arising from the procedure. No injections are needed. A topical agent is applied to the treatment area prior to beginning the skin tightening procedure. An experienced and trained specialist targets the treatment area with a specialized laser in an effort to restore your skin to a more youthful appearance. This high-energy laser has the ability to reduce the appearance of fine lines and creases as well as to lighten darker patches of skin. The laser is actually a beam of high-energy light, and it is perfectly safe to use. During the procedure, the laser gently removes the uppermost layers of skin tissue. Deeper layers remain untouched. The depth of skin that is removed is extremely thin. This strategy limits discomfort to the upper layers, while also promoting faster healing. Only a small portion of skin needs to heal, minimizing not only the amount of time needed to heal but also the level of pain experienced by the patient. Coolsculpting is a non-invasive procedure designed to transform the body by restoring its natural beauty through fat reduction. It can be used to reshape nine different FDA treatment areas, minimizing the presence of fat so effectively that the body looks slimmer and fitter. The Coolsculpting process is designed as a stand-alone procedure. There’s no need to begin an exercise routine or diet plan to maintain your results. Of course, doing so only enhances the results you achieve by giving your fat cells the chill. This FDA-cleared procedure embraces the technology behind cryolipolysis and uses controlled cooling to eliminate stubborn fat pockets, particularly areas resistant to diet and exercise. It is a fat freezing procedure that safely eliminates fat pockets while restoring a more youthful, slimmer appearance to different areas of the body. Whether you want to get rid of your double chin or slim down, Coolsculpting offers an excellent option to do so easily and painlessly. Coolsculpting delivers noticeable results with minimal bruising. Today’s treatments take approximately thirty minutes during an in-office visit to your cosmetic specialist. This procedure delivers a smoother tummy, narrower midsection, trimmer thighs, and slimmer arms using uniquely designed applicators. Any discomfort is easily treated with over-the-counter pain medication, allowing patients to jump back into their activities without hesitation. When you diet, your fat cells shrink. When you choose Coolsculpting, your fat cells are eliminated permanently. Fat cells die when they are frozen, and they pass through the liver where they are processed for natural removal from your body. The results achieved through this process are permanent, eliminating the need to starve yourself or spend hours each day on the treadmill. While Coolsculpting delivers permanent results, it does so gradually. It takes about three weeks before you will notice any improvement in treated areas. By the time three months have passed, your slimmer shape is readily noticeable. The full benefit of this non-invasive procedure appears in four to six months. Coolsculpting is entirely safe and involves little to no discomfort. You may experience minor pain and a tugging sensation during the procedure. The most common side effects include minor redness, bruising, and swelling for the first few weeks as the fat cells begin to travel to the liver for elimination. When you choose the Coolsculpting process, you avoid surgery. No invasive techniques are used, and no anesthesia is required. Your downtime after the procedure is brief, and you can go back to your daily activities immediately. The aging process is rarely kind to the skin. The loss of collagen leads to fine lines, wrinkles, and saggy skin, making people look older than they are. Finding the courage to reimagine your skin is easy once you learn about the pain-free, non-invasive options available for skin tightening. Isn’t it time to look and feel better than you ever have? If you want to discuss the non-surgical options available today, please contact the offices of Ageless & Beautiful Medical Spa today. 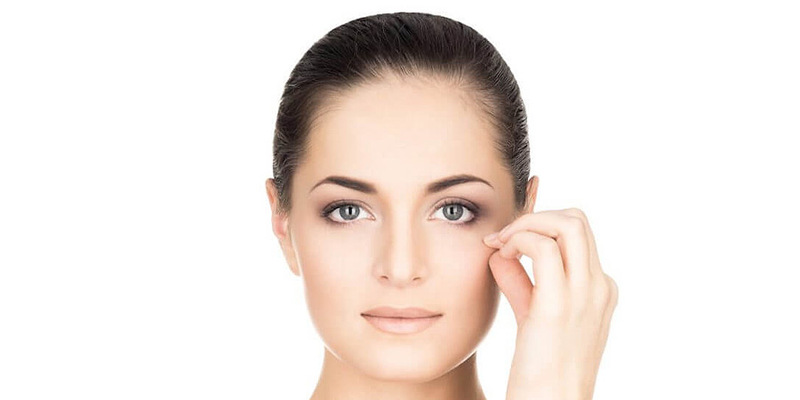 Typically, the type of dermal filler used to treat facial skin determines how long the results last. Restylane and Perlane provide quality results lasting between six and twelve months. The full range of Juvederm fillers delivers varying results. Juvederm Volbella, Juvederm Ulta Plus XC, and Juvederm Ultra XC provide enhancements lasting up to a full year, Juvederm Vollure lasts between twelve and eighteen months, and Juvederm Voluma lasts up to twenty-four months. Radiesse delivers facial enhancement for as long as eighteen to twenty-four months. Belotero Balance has a shorter duration of six months. All skin treatments come with the possibility of experiencing side effects. 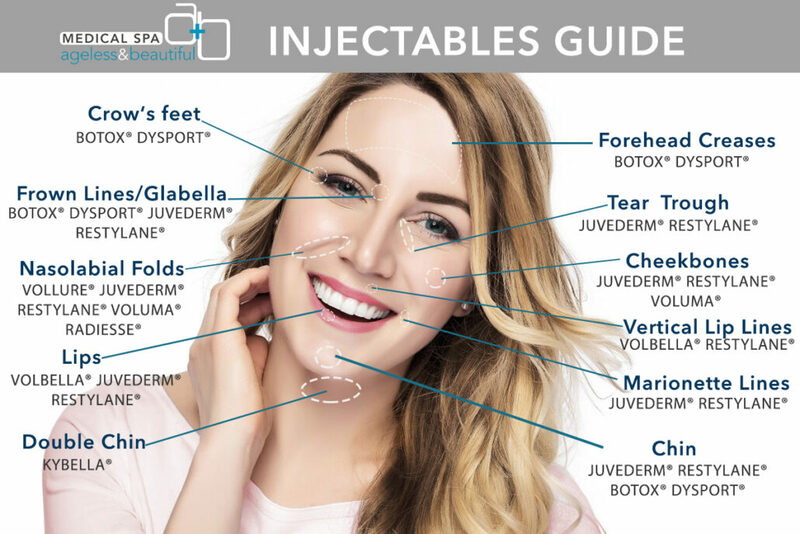 The most common side effects associated with facial fillers occur at the injection site and include minor redness, bruising, discomfort, or swelling. On rare occasion, a patient may experience tiny bumps beneath the skin, a rash, headache, or itchy skin. Each of these side effects is temporary and improve gradually over time. Some patients may not even experience side effects after the procedure, while a small number of individuals may have a mild allergic reaction to the filler’s ingredients. Dermal fillers formulated with hyaluronic acid are extremely safe, particularly because this ingredient occurs in the human body naturally. They are also FDA-approved, a fact which validates the fact that these substances are proven to be safe for their intended purpose as facial fillers. 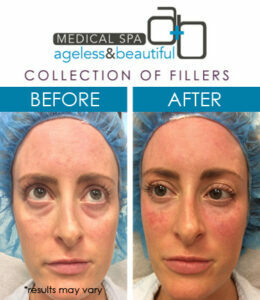 Choosing a trained specialist to perform your filler treatment enhances the safety of this type of skin treatment. In general, synthetic dermal fillers are safe to use as long as an experienced specialist performs the procedure. 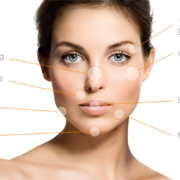 How much are dermal fillers? The cost of dermal fillers is influenced by the type of filler, the number of areas being treated, the size of the area being treated, and the expertise of the professional performing the treatment. The extent of the damage being corrected can also increase the price since it influences the number of injections needed during the procedure. The cost of a single injection depends on the type of filler and typically ranges between $500 and $800. Each additional injection increases the cost of your dermal filler procedure.